While Yosemite National Park is the obvious draw, I recently discovered two areas while exploring Madera County: Bass Lake and Oakhurst. 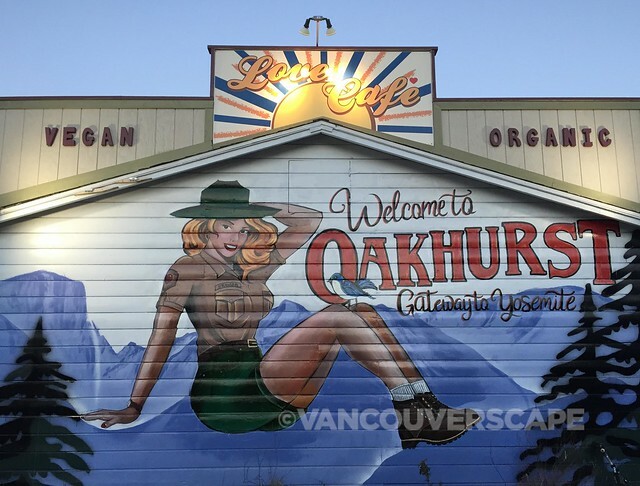 An easy base for exploring, Oakhurst lies in the foothills of Sierra Nevada mountains. It’s a small town that offers a micro brewery, a bit of shopping and dining, Relais & Chateaux luxury hotel Château du Sureau plus several wineries in the area. Oakhurst was formerly known as Fresno Flats. 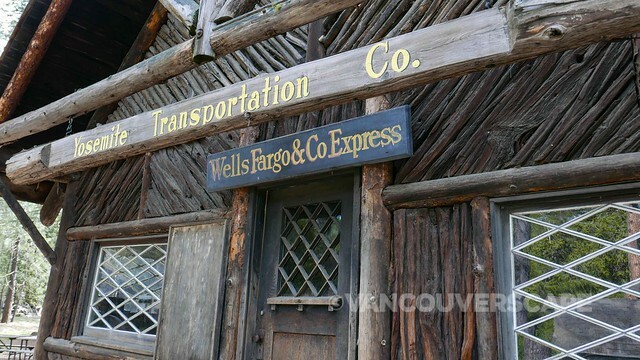 Its location along the Fresno River was a draw for lumber companies. Now it sees its fair share of tourism as the gateway to America’s third national park. 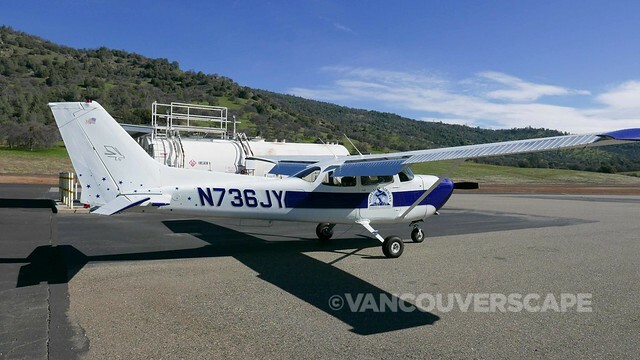 We begin the day with an aerial tour of Yosemite with AirBorrn Aviation (the name’s a combination of air and owner Tony’s (Borreson’s) last name. Our one-hour scenic flight begins with a safety briefing and look at a regional map where Tony points out where we’ll likely be headed, depending on conditions once we’re airborne. 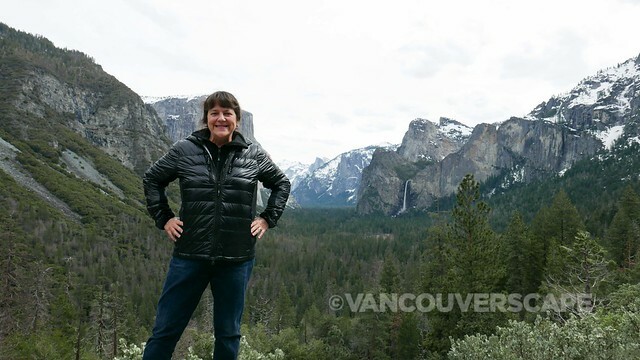 We cruise at 12,500 feet, taking in El Capitan, Bridal Falls (aka Valley View), then head southeast for a nice view of Yosemite Falls. 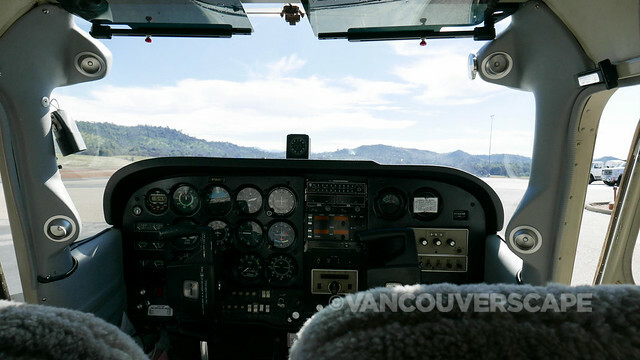 Our tour also takes in Signal Peak, Mariposa Grove and Bass Lake, all in a Cessna 172K-XP kitted with a high-performance 210 horsepower engine. Sheepskin covers on the four-seater and noise-cancelling headphones add a touch of luxury on this stellar day. All the while, Tony offers a lot of interesting tidbits of the area’s history, geography and scenic highlights, providing a wonderful compliment to a land tour. 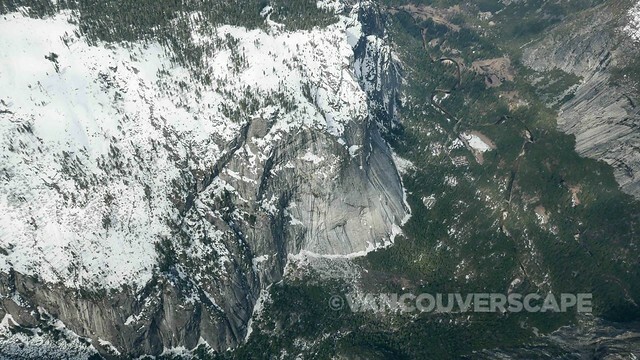 AirBorrn is located at blink-and-you-miss-it Mariposa-Yosemite Airport. 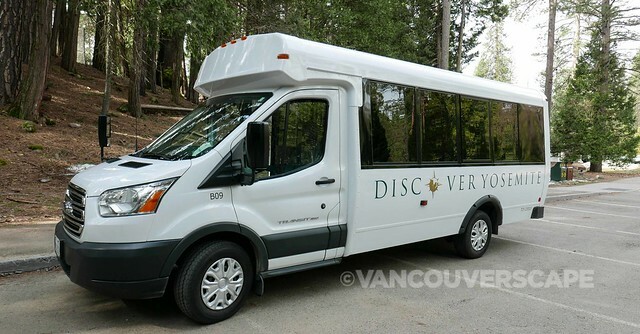 Scenic Tours are $199 per passenger, maximum of 3 passengers per flight with a maximum total passenger weight of 520 lbs. offered year-round, seven days a week, weather permitting. They also offer photography flights for amateurs and pros alike starting at $210 per hour as well as flight instruction. In the afternoon, it’s a boat ride on Bass Lake with the folks from Miller’s Landing Resort, located about half an hour from Oakhurst. This picturesque little enclave offers lakeside cabin rentals, marina boat rentals, a seasonal restaurant and small store, open from Memorial Day through Labour Day. 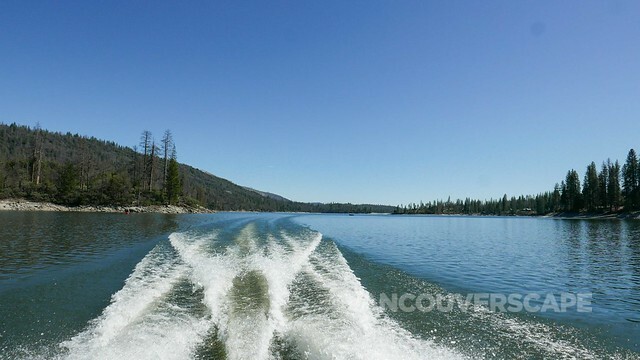 Bass Lake is well known in the these parts and its population swells in the summer. Water skiing, fishing, SUP and motor boating are the main sources of fun here, not to mention the spectacular mountains that ring the lake. 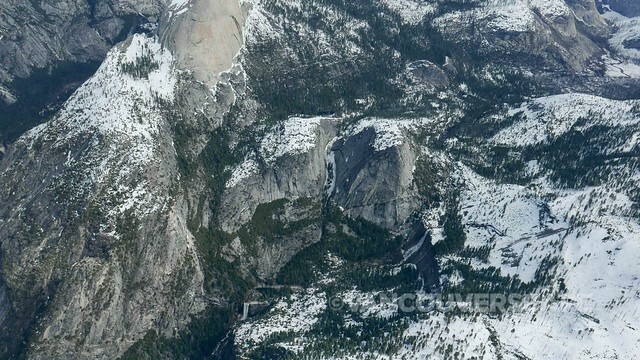 The next day I’m on a group outing with Discover Yosemite. Our friendly guide Glenn Bennik is a wealth of information on the park, from nature to history to foliage and everything in between. 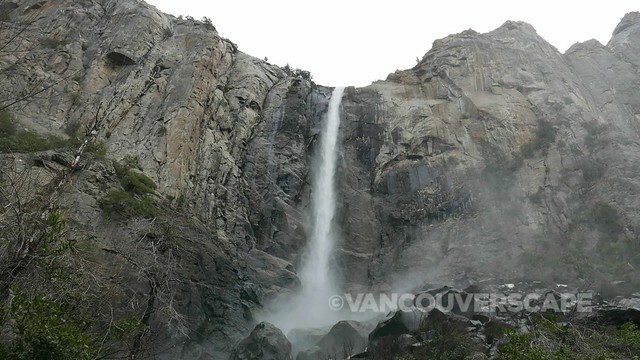 During our five-hour tour (beginning on highway 41N, eventually leading through the gates of Yosemite’s South Gate entrance) our group’s in for one visual treat after the next! At Fish Camp (5,000 feet elevation), our small group gets a first-hand look at how recent fires (Ferguson, Railroad) have devastated the trees. Luckily the drought is officially over (for now) with over 200% snow pack in the park. Weaving along the road, Glenn provides detailed information on John Muir (a Scottish-American naturalist), Chief Tenaya (a leader of the Ahwahnechee people in Yosemite Valley), James Savage (the commander of the California Militia, Mariposa Battalion) and other key figures that played a vital role in the area’s political history. 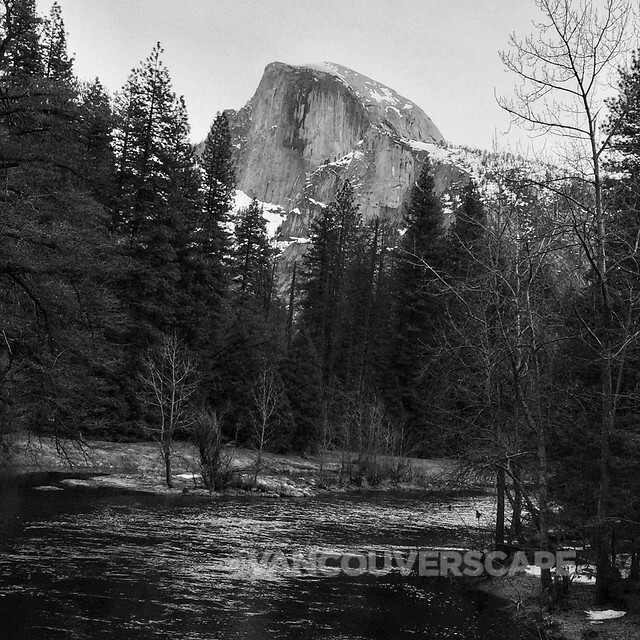 Of course, the moment we first lay eyes on Yosemite Valley with imposing El Capitan and Half Dome, it’s love at first sight. Lucky for us, there’s been an upgrade in the weather forecast and we manage to beat the rain for the day. With stops at impressive waterfalls, lovely meadows just beginning to see some spring green and snow-capped mountains, our day is filled with off-season splendour. Glenn finds us a nice spot with picnic tables and pulls out packed lunches for each of us (chosen in advance) along with apples, a pack of chip, soft drinks and water. In fact he’s well stocked with walking poles, extra coats, gloves, hats, even a couple of checkered picnic cloths for the table. Stops on the tour are dependent on the season. Right now a good portion of the park is closed due to snow so we focused on Wawona (with its collection of log homes forming the Pioneer Yosemite History Center) and key viewing points. 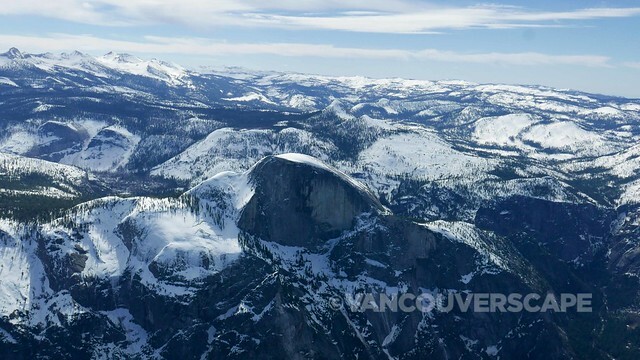 Discover Yosemite offers both private and group tours (minimum of four people) year-round. 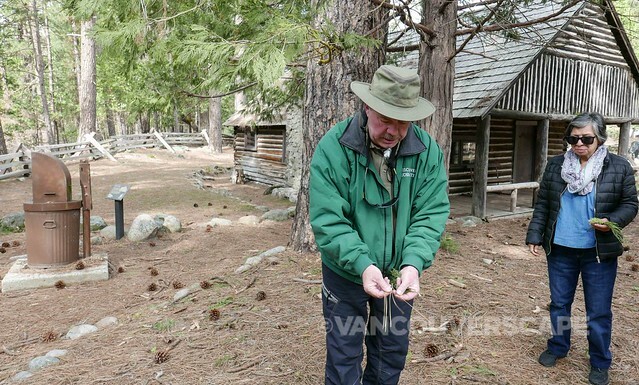 And if you’re lucky enough to get Glenn as a guide, fire away questions as he’s a treasure trove of information, always ready to point out the foliage while keeping a sharp eye for black bears, falcons, Mule deer and other critters during his tours. (Sadly we had no such sightings that day, likely due to winter just about to break into spring). In Oakhurst, get your fix of craft beer and locally-sourced eats at South Gate Brewing Company (40233 Enterprise Drive), run by a young couple since 2013. The seasonal menu is filled with an elevate pub menu including comfort food faves such as sweet potato fries, beer cheese and Bavarian pretzels, smoked cod fritters, burgers and pizzas alongside healthy salads and soups. I much enjoyed a glass of refreshing Juice Lee IPA (Citra, Simcoe, Crystal, Amarillo hops with London Fog yeast); other popular brews include Honey Badger Wheat, Deadwood Porter and Oaktown Pecan Brown ale. 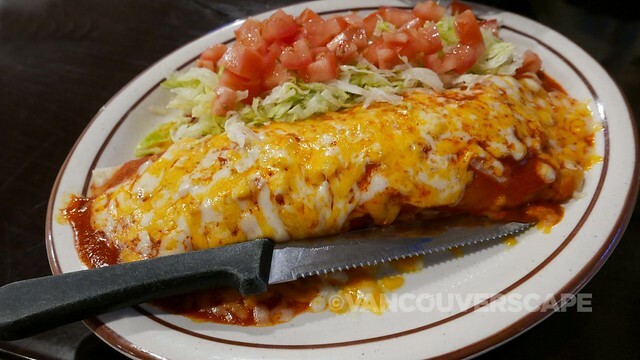 And in Bass Lake, consider dining at Casa Velasco Mexican Restaurant (54311 Rd 432). This sweet, authentic Mexican restaurant is well known for their fajitas however their chicken tortilla soup also comes highly recommended. 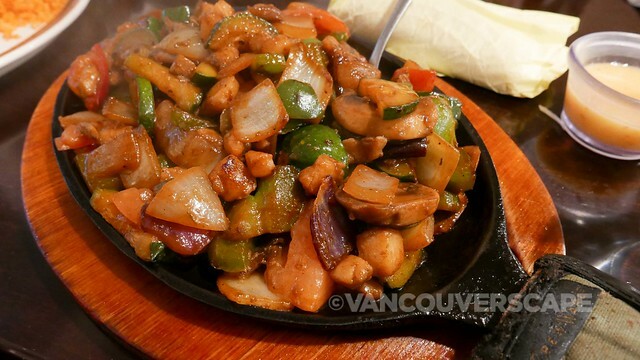 There’s a large menu of combination platters, a la carte items and burritos to choose from. You can’t go wrong here with good portions, homemade salsas and guacamoles in a family-friendly setting. My stay was hosted by Visit Yosemite | Madera County. Opinions, as always, are my own. 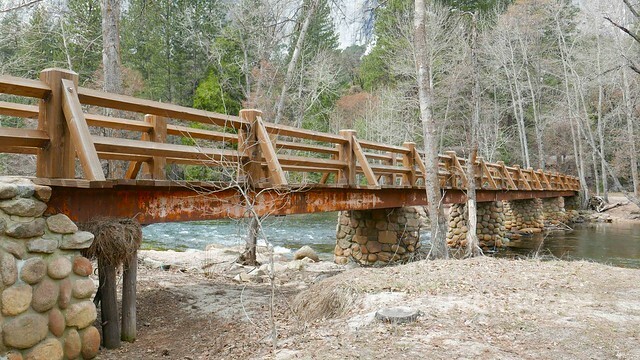 Check out Visit Yosemite and Madera County online for more information on trip planning, hotels and events.